Yeah you read it right! The new Yamaha R15 V3.0 is facing some issues in the body panels, which are failing to stay in place. One such manufacturing defect reported by several different people across country involves the plastic body panels wrapped around the fuel tank of the bike. 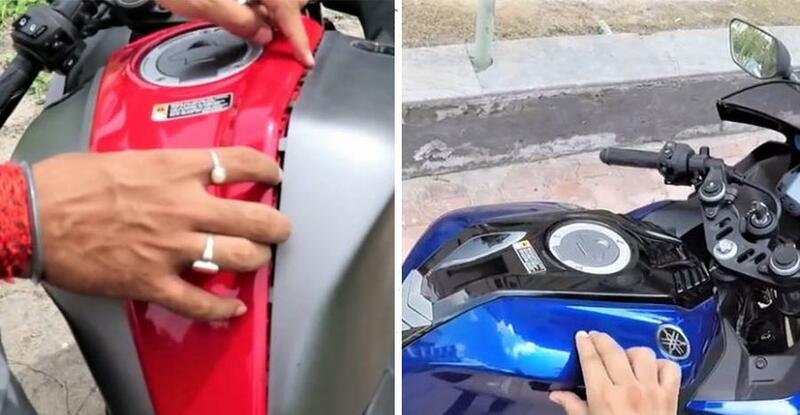 According to several Youtubers, the plastic body panel surrounding the fuel tank is poorly fastened and the brackets are not strong enough to hold the panel in position. As displayed in several videos, the panel can be easily dislocated from the body by just a push of the hand. This reflects rather poorly on the poor build quality of the bike and a few owners have already resorted to some home fixes by placing cardboard in between to firmly secure locks of the panel. Others have reported this issue to dealers, and asked for a replacement or some kind of a solution to this problem. Now though, there’s a happy ending. Taking serious note of this matter, Yamaha has now instructed dealers to fix the fuel tank panel issue on the R15 with brand new panels that the company is now shipping out. This fix will be carried out at no cost to the customer. Good going, Yamaha! The Yamaha R15 V3.0 was launched in India at the Delhi auto expo in February this year. Priced at Rs. 1.27 lakh, Yamaha R15 V3.0 is one of the expensive bikes in its segment. Powered by an all-new 155-cc single-cylinder engine churning out 19.3 Bhp and 15 Nm of peak torque, the R15 V3.0 is the most powerful bike in the segment leaving the segment competitors behind in speed runs. All the power is transferred via a 6-speed gearbox to the rear tyres. Yamaha R15 V3.0 is the first bike in its segment to come with slip-and-assist clutch as standard across the range. The new Yamaha R15 V3.0 is designed to mimic its bigger litre class sibling Yamaha YZF-R1 in terms of styling. Last week, Yamaha launched the Moto-GP-theme-based version of the R15 V3.0 at Rs. 1.30 lakh (ex-showroom).